Yes Very clean. (extra things were handy Paddle boards, Beach chairs, coolers.) The view was off the chain. We had a very good time there. The web was easy to plan and pay and info for codes and lock box to room. More than met our expectations! We loved the way it was decorated, the wonderful quality of workmanship and the attention to detail that was evidenced throughout. Ceiling moldings and well finished cabinets, wonderful countertops,large modern sink and faucet, lovely window coverings made of high quality fabrics, etc. We particularly loved the choice of soft colors that matched the ocean colors and made the outside an extension of the inside. Yes. Good view and location. Comfortable, and a soft bed. This condo went above and beyond my expectations. Adorable little complex, nice grounds, right on the beach and the inside was beautiful! Very efficient communication regarding our stay via email. It was perfect. yes, the condo was perfect and the location ideal. Nice restaurants in the area. We enjoy our stay at Kapaa Sands! The position of the condo in relation to the water exceeded our expectations - the condo itself met all expectations. KS9 exceeded our expectations in every way. Beautifully decorated. Vey clean. Many things seemed brand new. Overall, I really did like your company and the ease of booking, your follow up emails, your following through with providing the lock box code and payment request exactly when you said you would. You helped keep all info about the experience streamlined and simple. Hassle free and pleasant all around. We would definitely use you again and will refer you to friends. Hats off to the cleaning crew as well. I tried to give 5 stars on all questions above but the system only allowed me to give 4-1/2. Clean, clean, clean and quiet except for awesome sound of crashing surf and singing birds. The pool was perfect size. Plenty of seating and grills to use. Very nice. 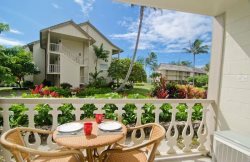 Kapaa Sands is a tropical oasis in a perfect location in a great little town, Kapaa. Maintenance guy was very nice. Perfect. Great communication with confirmation emails and pre-arrival emails. Everything went very smoothly. Definitely. The condo was cozy and nicely decorated. We had everything we needed to get our vacation off to a good start and enjoy the comforts of home. The view was amazing and we enjoyed sitting out on the balcony listening to the ocean. We stayed 8 nights at this condo and it exceeded our expectations. This was our first trip to Kauai and we will definitely be coming back again. We loved the central location on the island- it was close to everything. The grounds of this condo are beautiful and lush and the views are amazing. We found the condo to be very quiet- the sound of the crashing waves just below drowned out any other noises. The interior of the condo was very tranquil and inviting. We loved coming back to it after an awesome day exploring the island. We found that the condo had everything we needed- towels, beach chairs, boogie boards, coolers, etc. The kitchen was nicely stocked with all the equipment you would need. We did not use the pool on the grounds at all, but it looked nice. The view is amazing. Comparable resort rooms with this type of view will run you 400+ a night. This condo is an amazing deal. Overall, if you are looking for a relaxing and romantic place to stay- this is the condo for you. We loved it here and didn't want to leave! Yes, it was well represented on the VRBO website. The location was great! It was the best vacation we've ever had and this condo was a big part of it. The location is incredible. The unit is no more than 40 feet from the water with 180 degree views from the lanai. With windows on three sides we always had a breeze. We had breakfast on the lanai every morning and watched the sunrise. The condo is tastefully decorated. The kitchen was stocked with all of the necessary items. We kept the supplied beach chairs, umbrella, and boogie boards in our car trunk so that we'd be ready to stop at any beach during our exploration of the island. The walkways are lined with beautiful flowering tropical plants. It feels like your condo is located in a tropical forest. The ocean side of the unit has a carpet of closely cut green grass. We also appreciated use of the laundry facilities in the office. Superb. Very friendly and helpful. Lovely, quaint, pleasingly decorated. Beautiful location. Excellent. Absolutely! Our unit was perfect and beautifully renovated.